Cosmologists often debate the notion of a "multiverse": could it be that our universe is but one of many? Perhaps infinite numbers of other universes sputter and blink in and out of existence all the time, some of them eerily similar to the one in which we find ourselves, others with radically different conditions and governing laws. Last week I became convinced that the multiverse notion must be true, when I found myself standing on a red carpet, posing with actor Eddie Redmayne amid a torrent of flashing cameras. There's no way that could have happened in this universe. Not to worry; the following picture should allay any concerns that the experience has gone to my head. Caption: Eddie Redmayne and me in Washington, DC, discussing the new film, The Theory of Everything. Note: I'm the one on the left. The inscription was my cousin Ilene's idea; she's the smart one of the family. Original image (c) Danielle Paquette, The Washington Post. 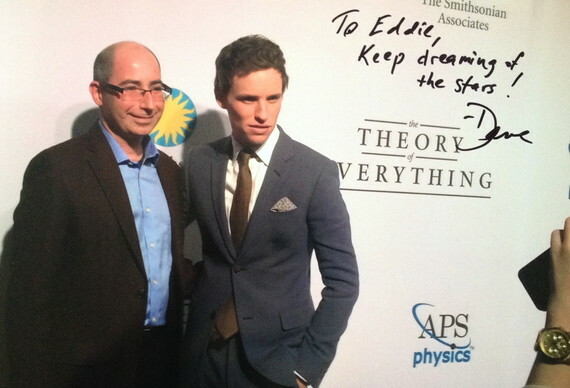 Redmayne and I were in Washington, DC, at an event hosted by the American Physical Society and the Smithsonian Institution: the city's premiere of the new film, The Theory of Everything, based on the lives of Stephen and Jane Hawking. Stephen Hawking, of course, is the world-renowned cosmologist whose research on black holes and "Hawking radiation," among many other contributions, continues to shape physicists' thinking about space, time, and matter. His bestselling book from 1988, A Brief History of Time, became a publishing sensation that outsold competitors a thousand times over: the Harry Potter of popular-science titles. And he did all that while struggling with a crippling, degenerative motor neuron disease. Redmayne and co-star Felicity Jones deliver moving, tender performances as Stephen and Jane Hawking. Redmayne's physical transformation, as he depicts how the disease ravages Hawking's body over time, is simply extraordinary. The film captures the swirl of passions, ambitions, uncertainties, rivalries, and frustrations of modern life, including a modern life in science. I found the movie's representations of various physical concepts -- such as infinite ruptures in the fabric of spacetime or the unexpected glow that Hawking predicted should surround black holes, thanks to subtle quantum-mechanical effects -- to be quite beautifully rendered. The film's focus, however, remains resolutely on the evolution of a more intimate cosmos: Stephen's and Jane's remarkably layered relationship. Between the opening of The Theory of Everything and another major new film, Interstellar --- inspired by the research of Hawking's friend, Caltech physicist Kip Thorne -- this season boasts a bonanza of big-screen depictions of black holes, wormholes, and the subtleties of time. We have certainly come a long way from the campy 1979 mish-mash, The Black Hole, which featured the best special effects money could buy (at the time) but reduced scientists (literally) to heartless robots. As I mentioned at the event in Washington last week, I am particularly thrilled by the timing of these new films' releases. We are on the cusp of a significant anniversary: 2015 will mark the centennial of Albert Einstein's elegant theory of gravity, his general theory of relativity. Hawking has devoted most of his extraordinary career to thinking through consequences of general relativity, and the topic continues to inspire the work of myself, my colleagues, and our very talented students, as we try to understand everything from the shape and fate of the entire cosmos to the dramatic changes our universe likely underwent during its earliest moments after the big bang. More than just a castle in the air, general relativity has also enabled remarkably practical devices. The GPS navigation system, for example, now embedded in our smartphones, cars, and airplanes, incorporates specific, subtle corrections from general relativity, which predicts that clocks should tick at different rates depending on their place in a gravitational field. In a very literal sense, general relativity enables us to find our place in the world, every single day. The New York Times science columnist Dennis Overbye objected recently that The Theory of Everything does not do justice to Hawking's science. Though I have long admired Overbye's writing, I found myself disagreeing on this point. Overbye complains, for example, that the film shortcuts Hawking's actual route to his prediction of "Hawking radiation," which was the culmination of months of calculation, prodded by other leading physicists. In the film, Hawking leaps to the answer at an unlikely moment, struggling with a sweater while Jane attends to their young children. At the event in Washington last week, screenwriter Anthony McCarten brought up that scene in particular, telling me that the film's version follows closely how Jane Hawking remembered the event. Stephen truly had a "Eureka!" moment there on the couch, sweater stuck halfway over his head, which left a deep impression on Jane. On this score, I imagine that both Overbye and McCarten are correct. Historians of science have known at least since the charming reflections of French mathematician Jacques Hadamard that many scientists report a "suddenness and spontaneousness" with which they arrive at a long-sought solution. Months of hard thinking and queries from colleagues are obviously indispensable, even though the final step often feels very much like a sudden and unexpected leap. And there is no denying the thrill, even euphoria, that accompanies those moments -- one of the special joys of scientific research. Beyond that particular scene, the film captures other critical elements of how science gets done. Hawking's mentor, the great physicist Dennis Sciama, is portrayed by actor David Thewlis, familiar for his role as "Professor Lupin" in the Harry Potter films. The casting is spot on: much like Potter, the irreverent, at-times arrogant young Hawking required a strong mentor who could by turns cajole, encourage, and inspire his studies. The film likewise foregrounds Hawking's intellectual debt to physicist Roger Penrose. Above all, the film brought to mind my colleague Helene Mialet's fascinating book, Hawking Incorporated. Mialet's main argument is that Stephen Hawking presents an extreme case that illustrates more general features of modern science. No one is an isolated genius. Every scientist is embedded in a variety of networks, both interpersonal and instrumental: from family members, mentors, colleagues, and students to the diagrams we draw and the other means with which we sketch, share, test, and refine our ideas. Hawking's physical condition makes these embeddings manifest. In that sense, Hawking's story, as rendered on screen, offers notable insights into scientific practice. So hat's off to The Theory of Everything: proof that scientists' curiosity, drive, relationships, and ambition really are ready for the big screen.